I’ve quoted countless of my favourite poems, but I do like to share my own work too. The last one, She Loved Me Once, was in June, so I was certainly due. After finding an old poem Some Things, I decided to fine tune another poem I wrote while back. and the returning of Winter. from an eternity in the oblivious background. One of the joys of this blog has been able to share the things that interest me and that have grabbed my attention. It’s also been great to have shown you some of my creative works with you in the past, including my poetry and writing process. So I thought why not put up one of my short stories, one I’ve always had a soft spot for. To give a bit of context. 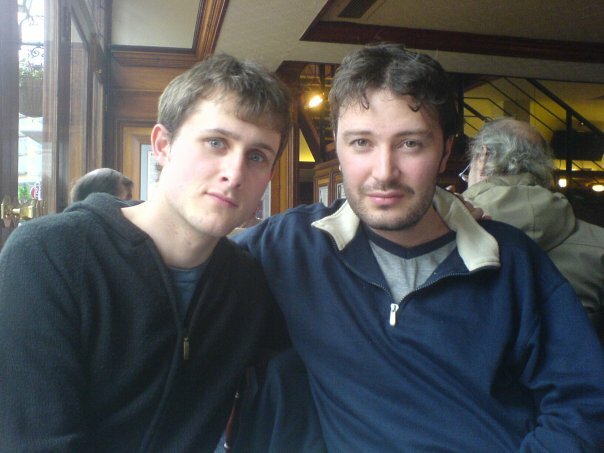 I wrote Lies and Secrets in college (the photo would have been taken a year or two later – I’m on the right) and even won some book vouchers when I entered it into a local competition. At the time I was writing lots of short stories and was even part of a weekly writing group. What with Google, Facebook, Twitter and LinkedIn, it hasn’t dated well but I still feel an attachment for it. Do you like it? I’d welcome any feedback so please let me know what you think. A newspaper I’ve been reading since I was a teenager has always had a back page feature entitled ‘A Life in the Day’; a reverse reference to the famous Beatles song. In it, a celebrity or even an ordinary person will explain a regular day and how that relates to their life. It continues to this day, and a few years ago I bought the 25th Anniversary book. As part of a writing project, I wrote one myself when I was 18. It’s amazing to look back the hopes, dreams and routine of myself over a decade ago. I hope you like it. And no, I still don’t drink tea or coffee. I’ve read so many great creative pieces by bloggers on here, and with some even explaining their process of writing, that I wanted to share something the way I write. I penned this years ago, before even going to university so it’s quite a feeling to look back on it. Hope you all like it. By the audience comforted by blurred certainty. Must be allowed to crash the revolving stage. That life is not remembering but redesigning, living not reliving. Lay ever infinitely away, ponder what I am thinking. Back to the chance for a paradise I never faced. But I am to be comforted. There lies a place: unseen, unheard of. Create their own images and ideas. For new members to arrive and fall.